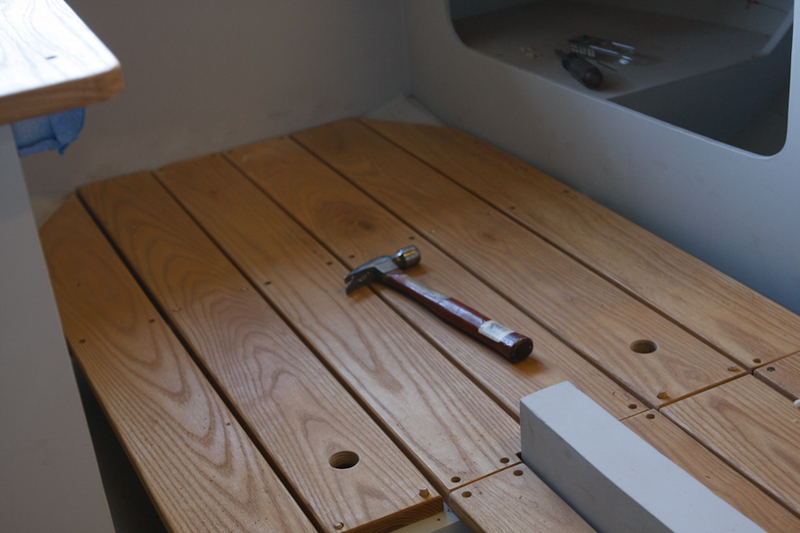 Last year I cut and sealed the floorboards. 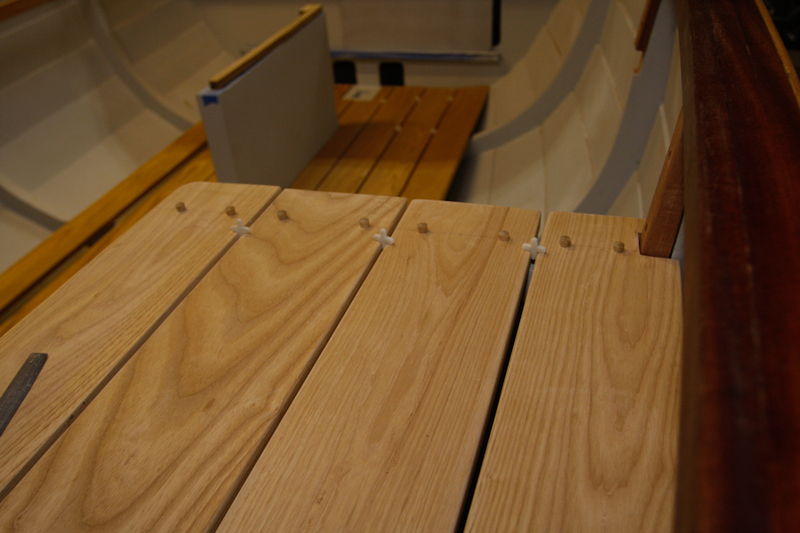 This week I drilled and dry fitted all the boards into the boat. I also drilled and fitted the seats. You sure have done a fine job here. I have a question regarding the fastening of your floorboards. My are fastened from the bottom up and I suffer from the screws tearing out. I noticed that you’re going from the top down and plugging the holes. How has that worked for you? 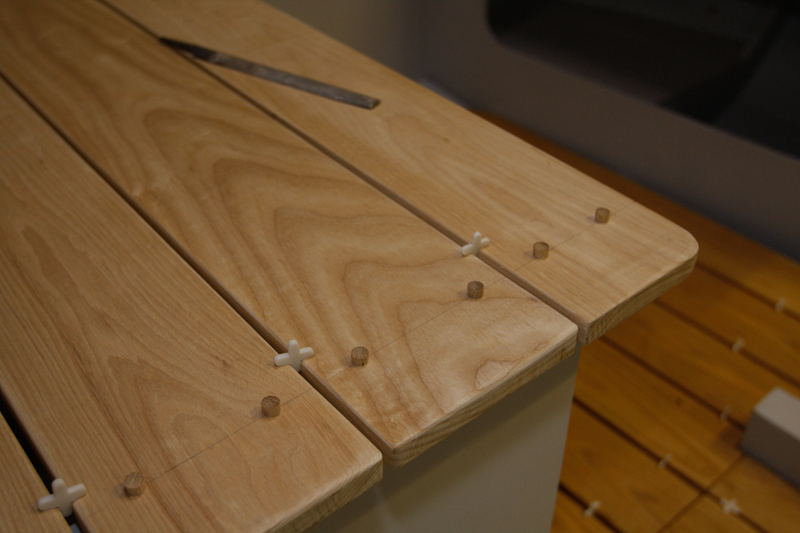 Are your screws tearing out as the floorboards flex? Hi Steve! My floorboards and seats are holding up as fastened from the top down. I have had a few plugs come loose, but so far no screws have worked out. 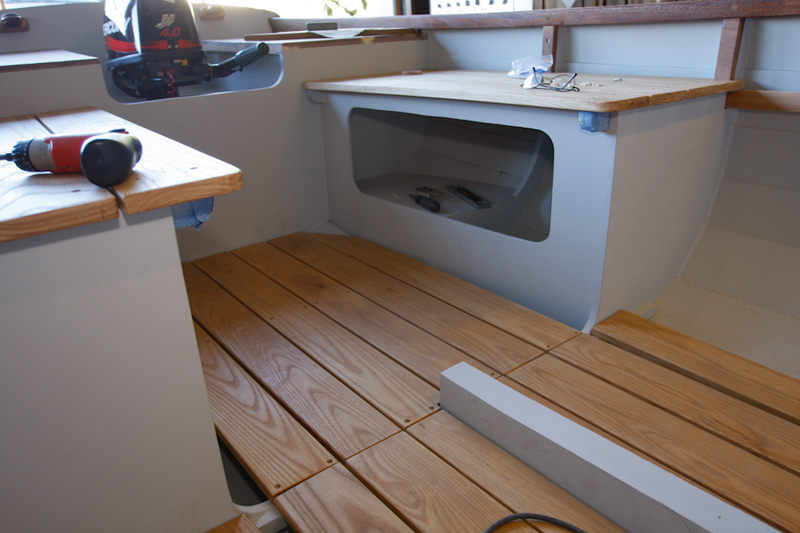 The bulkheads seem to provide sufficient support to the floorboard thickness to prevent any noticeable flex. I used pretty heavy ash for my floorboards and I would suspect that the same thickness in pine would have more flex. Even rift or quartersawn Ash is a bad choice to use anywhere outside. I only use Ash to bend and laminate indoors. Ash’s cellular composition between the cambian layers of wood growth is too open and allows moisture penetration to permeate throughout the wood itself. Other choices could of been vertical grain, heart redwood, teak, sapele, purple heart, white/red oak. I would never use Ash especially in something so beautiful like that sailboat that you beautifully built. James, thanks for this feedback. This is very good information and I appreciate you taking the time to educate. I will make the effort to document how my Ash decks fair over the coming sailing seasons. 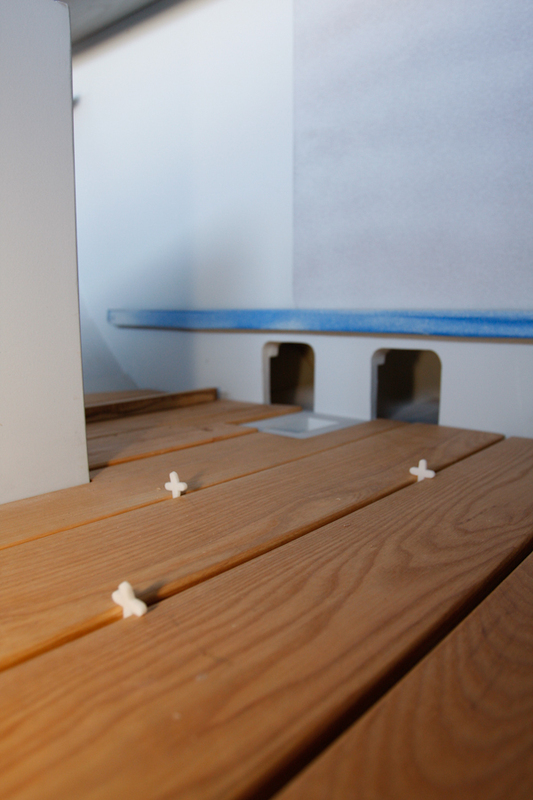 The fitting and spiling of the floorboards are very nicely fitted, pre prepared, and fastened into place. It looks like the wood you used is Ash? I hope you did not use Ash? I did use Ash James. What are your thoughts on this choice? I picked Ash because it looked good to me, but after the purchase learned that Ash is not a great choice due to rot issues. Because I am storing the boat in my garage when not in use I thought the rot issue would be negligible. The choice was personal but I wouldn’t recommend it for a boat exposed to the elements 24/7. I would appreciate a good discussion though on the use of Ash. I wouldn’t want anyone to blindly follow my lead if a ‘bad’ choice was made. Ash is used so often as a boat building material I was originally not too adverse to its choice. The more I read about Ash though, I now understand that it is listed as a perishable wood, not even a non-durable; so I would guess that in relatively short order Ash would deteriorate if left exposed to any moisure. 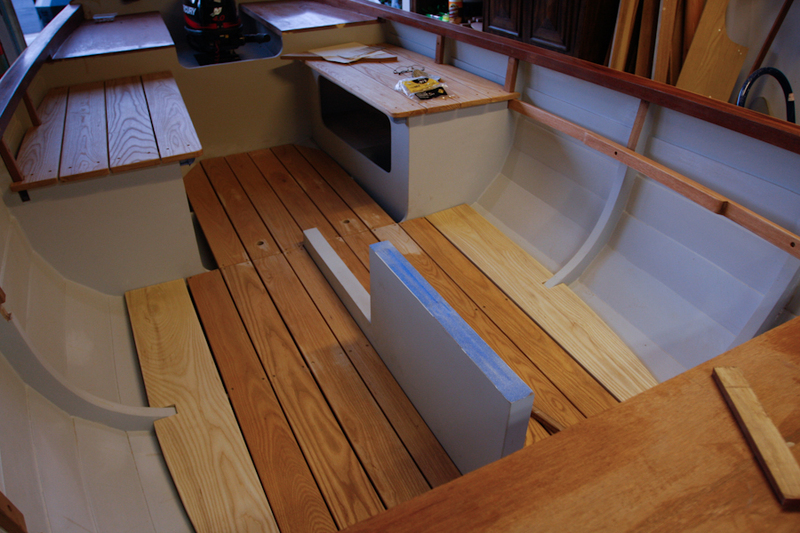 In my boat the Ash is used as decking and seat material and is exposed to air on all sides. It is sealed with a UV deck sealer and is not epoxy encapsulated. I should be able to simply sand and reseal any rot that develops. Time will tell if maintenance is too great. All of the decking is easily removable so if rot becomes unmanageable I will be able to redo the decking with a better wood choice. Very inspiring, Stan! By the looks of her you should be VERY PROUD! Thanks Yair. I am looking forward to finishing the wood work and then final paint and varnish. Once I get the boat on the trailer, I will start on the mast, spars, and finish the rudder. My sails should be coming in by early Feb. I hope to get Alice Gale in the water in early spring. How is your Ebihen coming along. I would love to see photo’s of your progress.